How I found my youngest daughter this morning. I mentioned to her that praying while sleeping didn't count. 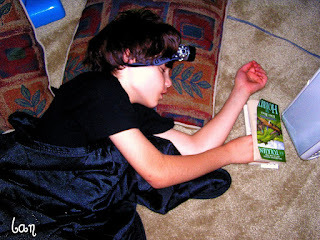 How I found my oldest son the other night after he spent hours reading literary classic Lord of the Rings. Yes, that is a lamp on his head. Long GI post. I got a little wordy. In the dark and all alone.